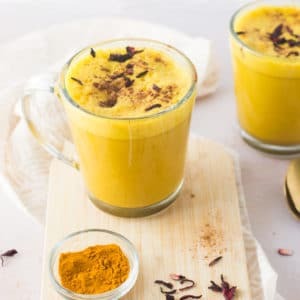 Turmeric Latte aka Golden milk is a beautiful health elixir! Coconut milk, turmeric, warm spices, and a hint of sweetener make this latte recipe so cozy and healthy. Add all ingredients to a small pot on low-medium heat. Continuously whisk vigorously until froth begins to form. Pour turmeric latte into a blender and blend until nice and frothy. Best consumed right away. You can substitute the coconut milk from the carton for canned coconut milk. This will yield a creamier latte but contains way more calories and fat!